John F. Kennedy International Airport is New York's main airport, located on Long Island in the southeastern part of Queens opposite Jamaica Bay and is operated by the Port Authority of New York and New Jersey. Most international flights arrive here. 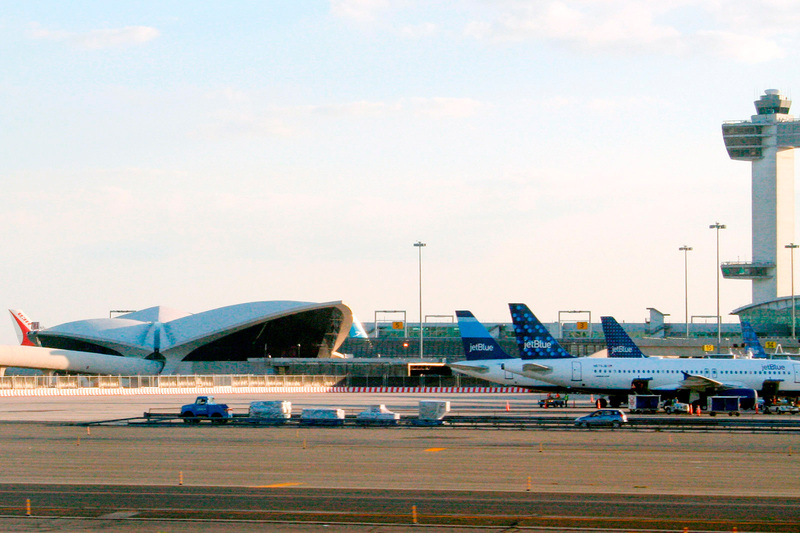 The structure consists of six terminals connected to each other by Airtrain JFK. There are more than 70 airlines operating on the airport which is a hub for Delta Air Lines, American Airlines and JetBlue Airways. For further information (800) AirRide or (800) 247-7433. To get the requested service you must call at least 24 hours in advance. The JFK car parks are divided into five areas, each marked with a different colour. 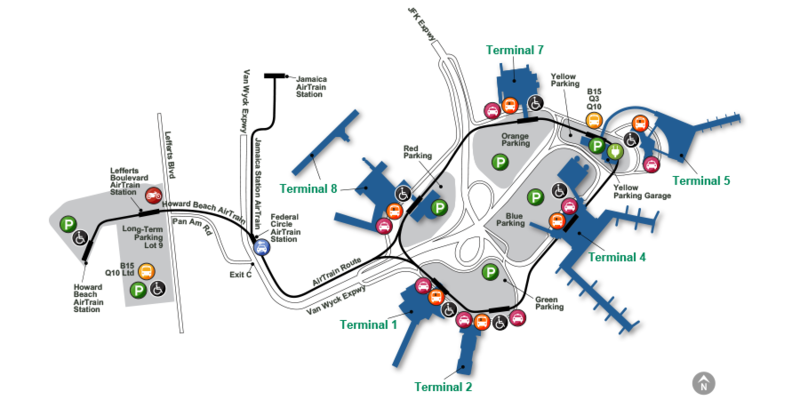 For convenience, the car parks closest to the terminal entrances have a limited number of spaces for disabled travellers who benefit from the lowest available rates. In the areas in front of the terminals there are areas, generally covered by shelters, for the arrival or departure from the airport with their own means. Assistance for the transport of baggage, check-in and transfer to boarding must be agreed with the airline at least 24-48 hours before departure. When travelling with a motorized wheelchair, it is advisable to ask the company about their transport rules before purchasing the ticket. In particular, the batteries should be checked. Accessible drinking water fountains are available at the various terminals. Each terminal has at least one accessible bathroom. There are also Pet Relief Areas dedicated to service animals accompanying the disabled. Near the airport there are hotels and motels of various categories, connected by free shuttles. To book hotels there are special telephones available at the following terminals or stations. The airport has five short stay parking areas inside the road ring that connects the various terminals plus an external one 6.4 km away for the long stay connected to the terminal with the AirTrain. The rate of short stay (Green, Blue, Yellow, Orange and Red Parking) is $4 every half hour, $8 every hour up to a maximum of $33 per day, a figure that is reduced to a limit of $18 for disabled people. In the long-stay parking lot you pay $6 for every 8 hours or fraction and $18 for every 24 hours. In front of the terminal you cannot park but only pick up and drop off passengers. There is a parking lot, 5 minutes from the terminal, called Cell Phone Lot, where you can wait for incoming passengers. Finally, there is the Kiss and Fly, located at Lefferts Boulevard AirTrain Station, where departing passengers can take the AirTrain to reach the terminals free of charge in 10 minutes. AirTrain connects airport terminals with car rental companies, shuttles to local hotels, long-stay parking, MTA New York City Transit buses, Howard Beach subway station and Long Island Rail Road (LIRR) Jamaica Station. The service operates 24 hours a day and costs $5 for external connections, while it is free inside the airport and to the station of the car rental companies and hotel shuttles. The subway costs $2.75 for each destination, while for the LIRR the price varies according to the destination. The frequency is every 7 minutes during rush hour, 10 minutes during the day and 15 minutes in the evening and night hours. - New York City Bus: Q6, Q8, Q9, Q10 Ltd, Q20, Q24, Q25, Q30, Q31, Q34, Q40, Q41, Q43 Ltd, Q44, Q54, Q56, Q60, Q65 Ltd. The car rental companies can be reached by the AirTrain train at the Federal Circle Station stop. Taxis have the classic yellow colour and the licence number is written on a medallion placed on the bonnet of the car. For the connection with Manhattan there is a flat rate of $52 to which must be added $4.50 during peak hours (4-8 p.m. weekdays, excluding holidays), for a total of $56.50. Also for connections within the state of New York, but not in New Jersey, a state fee of $0.50. Finally, there is a tip of around 15%. In case there are multiple destinations, the flat rate is valid for the first destination, then the price of the taximeter is applied. For all other destinations the taximeter rate applies, the initial amount of which is $3, and extras such as paying for tunnels or bridges. The fare is valid for all passengers who are at most four or five if the taxi is a minivan. The price for Connecticut/Suffolk/New Jersey/north and West Westchester County connections must be negotiated with the taxi driver before departure. If you have any complaints or lost property, please call 311. At the Welcome Center/Ground Transportation Information Counters, at the arrivals area level, you can ask for information on how to use the services of authorized private companies that operate car and minibus services. A valid and economical solution are Shared Ride Services, generally carried out by minibuses that are shared by several people and have prices starting from $ 15 per person.